It’s always interesting to see brands trying new things, whether it be a new fit, or some added detailing or, in this case, the denim itself. 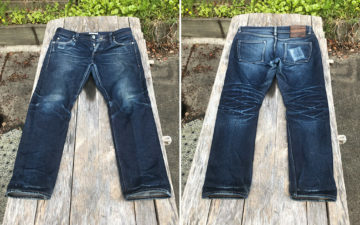 Today’s Fade of the Day features a pair of Denim.Lab Regular Kuroki Prototypes worn for over two and a half years with three washes and a soak, and some well earned fades. 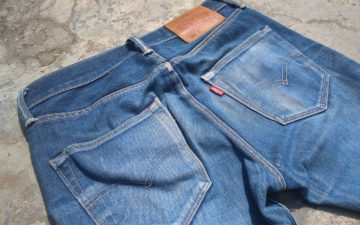 It seems that although they haven’t continued production of this jean, the wear patterns show some strong fade potential and some serious contrast. 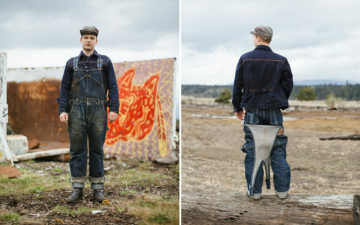 You may recall a certain pair of baby raw denim we recently covered – the younger sibling to Denim.Lab’s signature jeans. With strong seat fading, white knees, and some repairs needed around the main seams, you know these jeans were worn hard. And even though the denim didn’t make it to full production, there are plenty of pairs that have. Learn more on Denim.Lab’s Instagram.